An 80/20 PG/VG ratio means that these decadent and deliciously-dark juices kick out some serious clouds without being too demanding on your coil. Each flavour is available in a handy 10ml bottle in a choice of 0, 3 or 6mg nicotine strengths, and if you’re feeling somewhat gluttonous then grab a 50ml shortfill version along with a bottle of our Vapouriz Hot Shot nicotine liquid to create your desired concentration. The Pure Evil range began with seven original flavours inspired by each of the deadly sins. First on the immoral agenda was Wrath: a furiously-delicious concoction raging with tarte raspberries and creamy coconut. Sloth slowed things down to a leisurely pace with its gentle blend of seven sumptuous berries, while Greed kept everyone coming back for seconds (and thirds, and fourths…) with notes of fresh mango set against a fragrant backdrop of sticky rice. Lust will have you questioning if it might just be love as soon as you get a taste of its smooth strawberry custard, while vapers of lesser liquids will be green with Envy when they catch wind of this apple and cinnamon tart-inspired concoction. Pride smugly bottles the taste of warming butterscotch with just a hint of refreshing menthol, and we strongly advise that you give in to the glutton within with the gorgeous vanilla custard Gluttony. In an effort to keep our customers from committing sinful acts, we decided to indulge you even further with five additional flavours to accompany the original Pure Evil line-up. Cold Blooded provides a deliciously-decadent blend of seven berries, mercilessly bludgeoned by shards of ice-cold mint for a cooling rush on the exhale. Condemn your taste buds to eternal Jamnation with this warm and sugary raspberry jam liquid, and make waves with Silent Pool’s sweet notes of lemonade and vanilla. You’ll find that Scream Queen is definitely something to shout about, as no other e-liquid bottles the taste of English custard cream biscuits with such devilish accuracy. On the lookout for something with a bit of a kick? 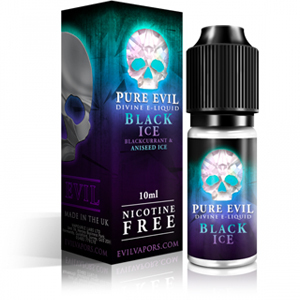 Black Ice is a heady mixture of sharp blackcurrant, spicy aniseed and cooling menthol emerging from the murky depths to tantalise your taste buds. Our Pure Evil e-liquids perform amazingly with any sub ohm setup, producing huge vapour bursting with rich, pure flavour. We recommend pairing these juices with the VBox 40w and our patented VBox Sub Tank Lite for the ultimate sub ohm experience. With a 40w fixed wattage and 2200mah internal battery the VBox is a capable and high-performing kit which is ideal for vapers on a budget or those looking for a simple unintimidating device to enjoy their sub ohm juices. You can also vape the Pure Evil range with the V-Switch crossover kit which comfortably accommodates classic, 50:50 and sub ohm liquids. The V-Mini marks the first exciting collaboration between Vapouriz and industry giant Innokin, resulting in a sleek, compact and seriously-stylish bit of kit with a simple operation style. A perfect option for new vapers looking to explore the world of sub ohming.